In this ad-driven world, customer-benefit products rarely come to limelight. I am a bad customer. Neither I have patience, nor energy and time to make best deals in all my purchases. That's why I bank on experts, other family members and even colleagues who extend their help to get best price. But when it comes to my area of interest i.e. books, my perception is different. I am an embodiment of patience. I search bookshops not only for best collection but for best price. No doubt that online ordering of books is fairly an easy task once you know the particular book you want. But it is always not the same case when you want to explore the book-world. You come to know the availability of some great books only when you physically visit bookstores. That's why, regular visits to bookshops must be a ritual to every bibliophile. My 5 years of stay in Delhi helped to visit all the best bookshops which hugely credited for my personal library. I visit bookshops more frequently than temples. Because, they are my gods. This hobby to read books is self-driven. My dad injected the flame to improve my language abilities that made me to turn to books that expand my knowledge horizon. My search for new temples of books is relentlessly going on. To fructify this effort, some days back, I read an interesting article "Struggle for Survival'' in a prominent newspaper's literary edition ( The Hindu, Sunday, July, 19, 2015) where ground reports said the fate of independent bookstores in the era of online bookstores. While writing the scenario on Delhi, Swati Daftuar mentioned about one bookshop - Midland - The Book Shop which is located in South Extension, Part1- I, hardly 3 kms ride from my South Delhi home. 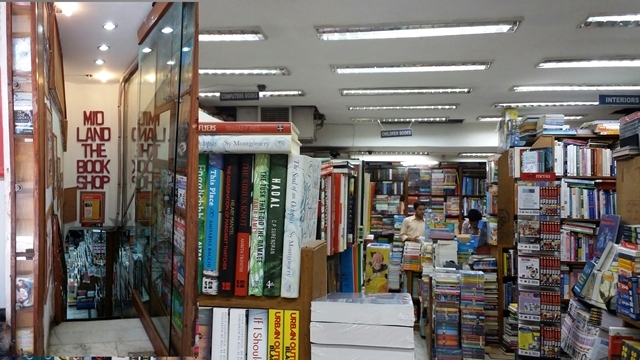 She says that it is one of the oldest book stores in Delhi founded in 1970 and being run successfully by three generations of Hyderabad Baig family. Being excited with the news of an oldest bookstore, I took the time and visited the book stores. When I reached there, I was baffled by the sea of books. Even to browse the books of your desired genre, you need to have sturdy legs to stand long hours to move through the aisle of book-shelves to browse the books. Though the books are little organized compare to another chain of bookstores - Full Circle Bookstores, Delhi - a flat 20 % discount for every purchase is a great news. My impulse drove me to take two books of Vinod Mehta : Lucknow Boy, a Memoir and his other book, Editor Unplugged, both published by Penguin, India and would be long remembered as envious collection. One of the legacies I will leave to my two children will be a library of books that have inspired and touched me. Like Robin, I have two children who one day would realise the value of my priceless collection and hope they also add some more books and pass on this legacy to their posterity.